There’s that old saying that a picture’s worth a thousand words. But is it really that cut and dry? Think about it. Sometimes a picture’s too blurry, too bright, a head’s cut off or there’s a bad angle. Realistically, not all pictures are worth a thousand words. And if you have any doubt of that, a quick “photography fails” search in Pinterest will leave you either giggling or cringing – or maybe even a little of both. But what if good photography – true photography – is more about a calling? Wouldn’t that kind of explain the cringiness of some of those Pinterest fails? It makes sense. Let’s take Eric Guel, for example. Eric truly feels that there is legitimacy to the old adage that you don’t choose photography, but it chooses you. Prior to high school Eric had no photography experience. None whatsoever. Just by chance he took a random Photo 1 class, and he liked it. He really liked it. It’s almost like photography grabbed a hold of him and wouldn’t let go. A love for photography was now deep within Eric’s heart and soul. After three years of photography classes in high school, Eric decided to pursue journalism and photojournalism in college. Despite the fact that both parents were Houston Baptist University alumni, Eric followed his older brother’s footsteps and made the move to Waco to become a Baylor bear. A photographer in Waco? Seriously, Waco would have to be a photographer’s dream-come-true. There are so many scenic backdrops to explore. There’s Cameron Park, the Waco suspension bridge, the downtown Waco murals and just about any spot on the Baylor campus. You get the idea. Waco is chock-full of fabulous, on-location photography spots. For a heart-and-soul kind of photographer, Baylor is the perfect choice. While at Baylor, Eric studied photojournalism under photography professor, Clark Baker. One of Eric’s main takeaways from Professor Baker is it’s all right to fail and it’s also all right to just be yourself as a photographer. As a student, Eric worked with the Lariat which ultimately helped him land a job in the newspaper industry after graduation. And like many trailblazing photographers before him, Eric started out doing part-time photography for weddings and family portraits with Eric Guel Photography. A few years ago, however, Eric decided to take photography on full-time. He was actually motivated to make the giant leap after hearing Fawn Germer speak at a Baylor Pro Sales event. The entire talk was about taking risks to do what you love to do. That was all the nudging he needed. 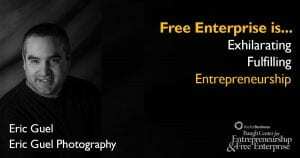 Eric also decided to shift his business focus to commercial photography by primarily serving businesses with convention and conference photography, headshots, marketing collateral and website images. Since then, he has been able to capture images for organizations such as Bausch + Lomb, Cognizant, Hewlett Packard, Salesforce and even for his beloved alma mater. Maybe Eric is onto something. Maybe there is some legitimacy to you don’t choose photography, but it chooses you. It certainly looks like photography has chosen this Baylor bear. Sic ’em!